St. Petersburg, FL - His Grace Bishop Dr. MITROPHAN scheduled the St. Petersburg Deanery Clergy Confession and Christian Education Deanery meeting for Wednesday, April 3, 2013 at St. Sava Serbian Orthodox Church, St. Petersburg, Florida. The St. Petersburg Deanery includes ten parishes in the states of North Carolina(2), Georgia(1) and Florida(7). The Deanery consists of a populous and large geographic area. Very Reverend Stephen Zaremba is the Dean of the St. Petersburg Deanery. 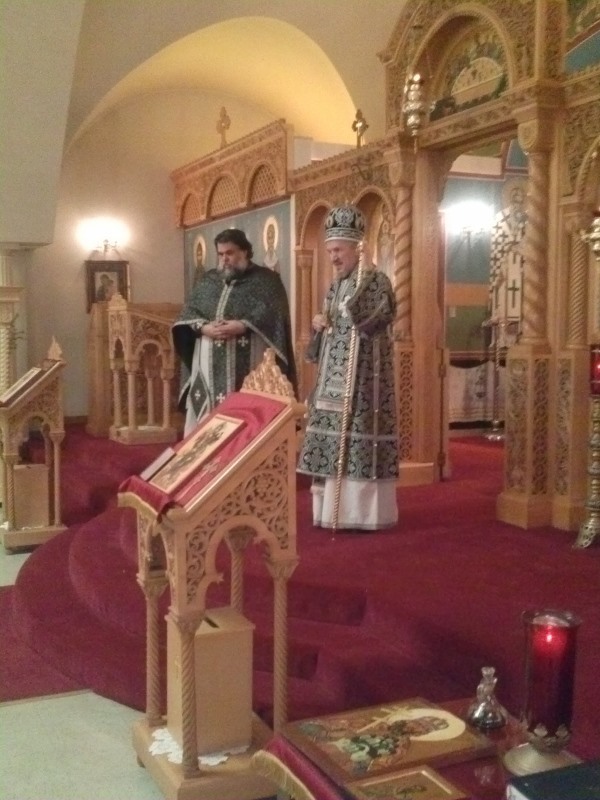 He also is serving as the parish priest of St. Sava Serbian Orthodox Church in St. Petersburg, Florida. 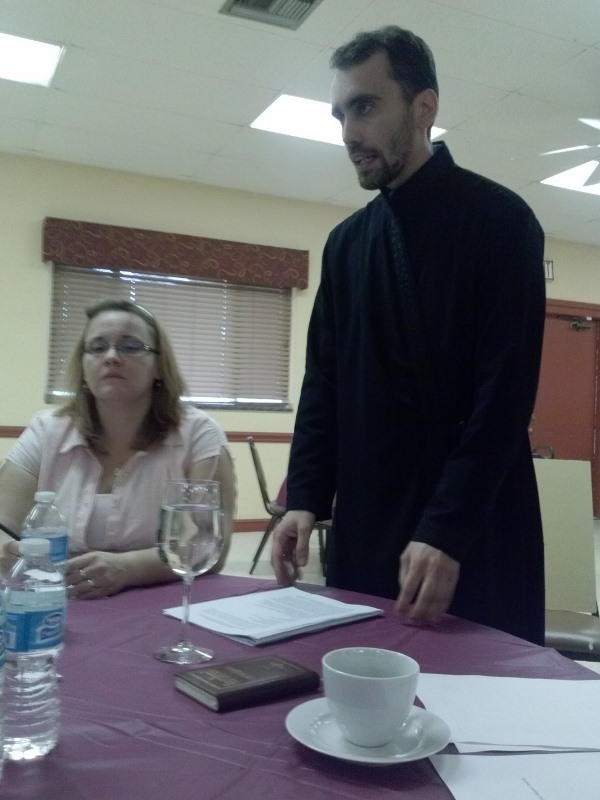 Father Zaremba and the St. Sava parish hosted this meeting. 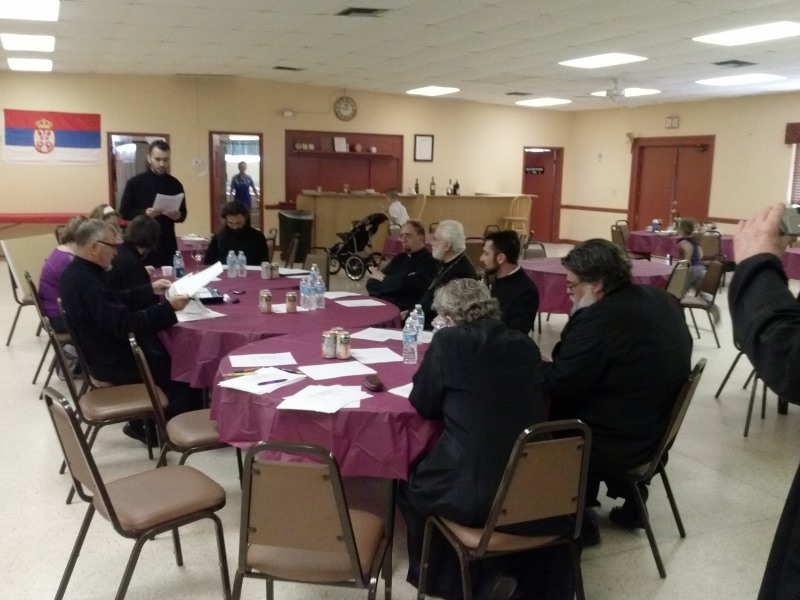 Vespers were served on Tuesday evening, April 2, 2013. 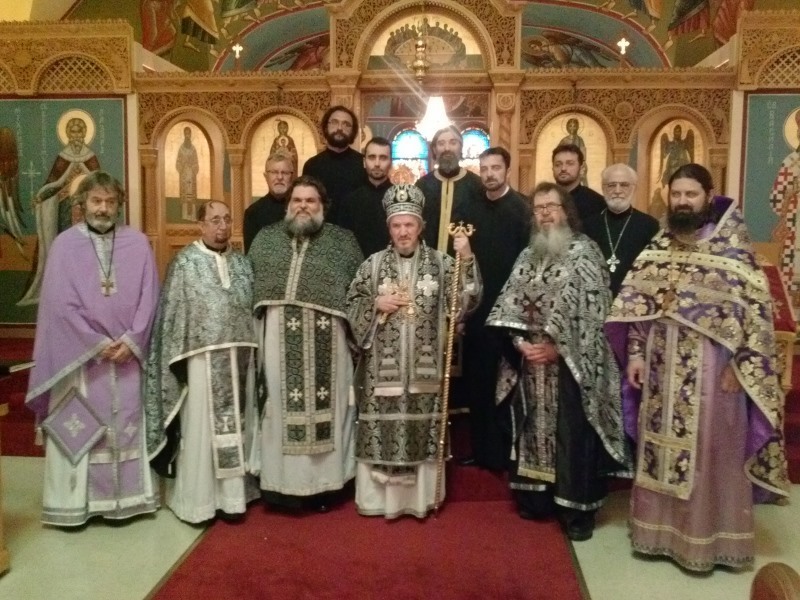 Clergy Confession was held the morning of April 3, 2013 followed by the Hierarchical Liturgy of Presanctified Gifts. Father Rodney Torbic served as priest confessor. Six priests served with His Grace at the Liturgy of Presanctified Gifts. Priests serving included Very Reverend Stephen Zaremba, Very Reverend Svetozar Veselinovich, Very Rev. Stavrofor Dr.Rodney Torbic, Very Reverend Dragan Zaric, Reverend Ivan Voloshchuk and Very Reverend Gregory Trakas(Greek Orthodox Church). 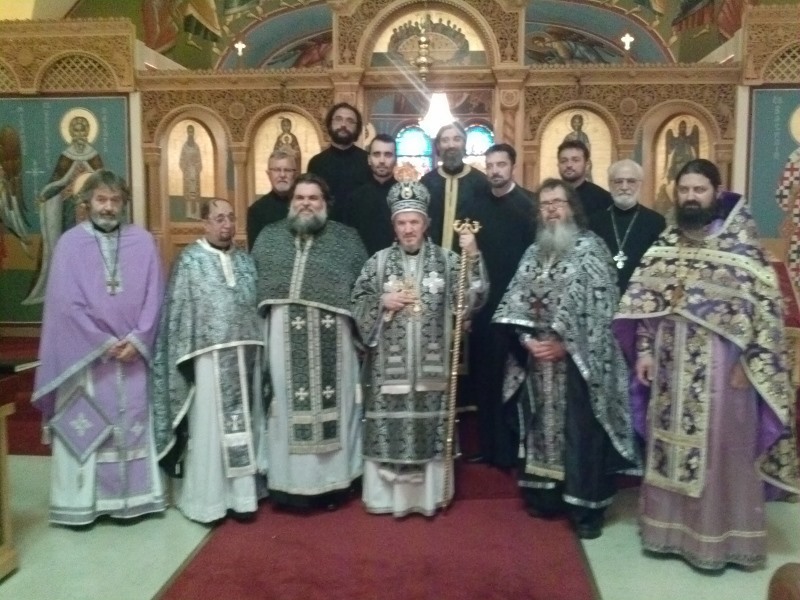 Additional Diocesan clergy attending the Liturgy of Presanctified Gifts and participating in the Deanery meeting included: Protopresbyter Stavrofor Jovan Todorovich, Protopresbyter Stavrofor Miloje Raicevich, Reverend Father Ljubisa Brnjos, Reverend Father Miladin Blagojevic, Reverend Father Dragoslav Kosic and Reverend Father Stanislav Kravljaca. Father Peter Tutko, an Orthodox priest in the area came for part of the day. Protinica Svetlana Zaremba, Protinica Mirjana Todorovich and Protinica Andjelka Veselinovich were in attendance. Danijela Pejic, Danijela Kosovic and Cedo Radovanovic participated in the Deanery meeting. 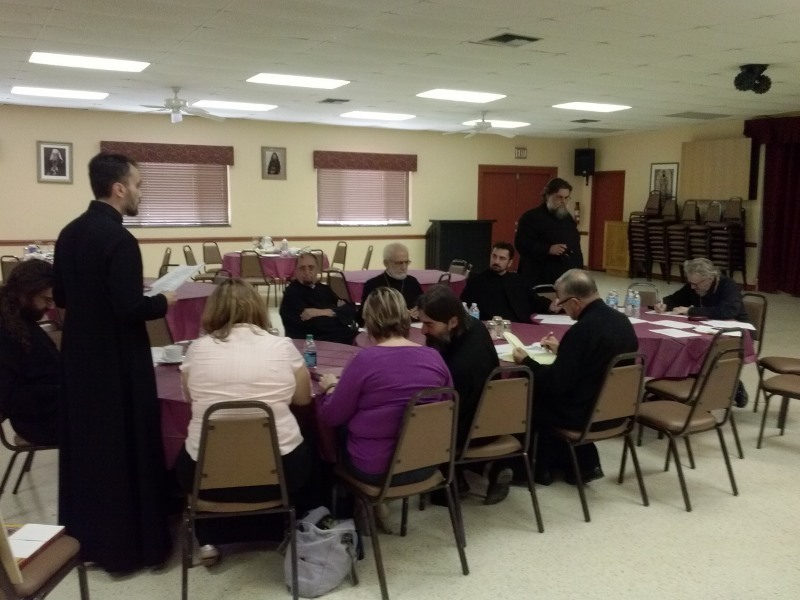 The Deanery meeting began with prayer following the lunch provided by the host St. Sava Church. Father Zaremba, as Dean and host priest warmly greeted and welcomed the participants. Father Miladin Blagoljevic was the featured speaker designated by His Grace to prepare a presentation on Christian Education. Father Blagoljevic has experience in several parishes and is familiar with the complexities and challenges of developing Christian education programs. He drew from his experience and presented thoughts relevant to the St. Petersburg Deanery. Oral reports on their respective parish Christian education efforts were presented by the clergy from the participating parishes. Written reports from each parish are submitted in addition to the oral reports. This was the most lengthy and extensive discussion of Christian Education in this Deanery. During the discussion period, attention was given to having a camp for Deanery youths and also focused on contemporary societal issues. The importance of parents devoting time with their sons and daughters and keeping them connected with the Church was emphasized. His Grace Bishop Dr. MITROPHAN summarized thoughts for further development of Christian Education programs in this Deanery. His Grace thanked the host parish and Father Zaremba for the gracious hospitality and the attendees for their presence and participation..